Dhanawat J*, Kumbhar P**, Honavar P***, Samant PY****. Acute pancreatitis is inflammation of the pancreas generally triggered by activation of pancreatic trypsinogen, followed by autodigestion if untreated. Pancreatitis in pregnancy is a rare phenomenon, although acute episodes in mothers having chronic pancreatitis are seen.Here, we present two cases of pancreatitis in pregnant women with varied presentations and outcomes. Acute pancreatitis is rare in pregnancy with incidence of 1in 1000 to 1 in 10,000. [1, 2] Severity of pancreatitis affects the pregnancy outcome. Causes in order of frequency are gall stones, alcohol, hyperlipidemia, congenital ductal anomalies and autoimmune pancreatitis. Mutations in cystic fibrosis transmembrane conductance regulator gene are also associated with pancreatitis. Gestational age, signs of preterm laboror abortion, chronicity, severity of the disease and the cause of pancreatitis decide the outcome of pregnancy. Case 1: A 30 year old primigravida, known case of chronic pancreatitis, with 33 weeks gestation presented with complaints of abdominal pain, vomiting and fever since 1 day to emergency services. She had no obstetric complaints of bleeding or leaking per vaginum or decreased fetal movements. She had the first episode of pancreatitis 2 years ago due to pancreatic duct calculi, at which time extra-corporeal shock wave lithotripsy (ESWL) was done, and endoscopic retrograde cholangiopancreatography (ERCP) with pancreatic duct stenting was done. Following this, she had three episodes of acute pancreatitis all of which were managed conservatively. In our hospital, she was started on antibiotics, analgesics and antiemetics. Ryle's tube was inserted. She was started on tocolysis and given two doses of steroids for fetal lung maturity. Her lipase levels were 123.1 units/ liter. Liver and renal function tests were normal. There was no hypocalcemia or hypertriglyceridemia. Abdominal ultrasonography (USG) showed a bulky pancreas and peripancreatic fluid collection. Pancreatic duct showed dilatation of 3.7 mm. Patient improved on supportive management and was discharged. Patient was readmitted at full term in labor and delivered uneventfully. Case 2: The second case was a 28 year old primigravida, registered at a private hospital on regular follow up. In the first trimester she developed an episode of severe vomiting for which symptomatic treatment was given. At 36th week of gestation, she had epigastric burning and pain. She was treated in a private hospital but there was no symptomatic relief. After a few days she started having nausea and vomiting, when she sought treatment at our tertiary care center. Patient was admitted in surgical care with complaints of severe nausea and 5 to 6 episodes of vomiting in 12 hours, with epigastric pain. Blood investigations revealed hemoglobin of 12 g %, white cell count of 15580 per cmm and normal platelets and blood sugar levels. Amylase levels were 1124 units/l, lipase 3248 units/l. Her serum cholesterol was 131 mg % and triglycerides were 266 mg/dl.. USG abdomen was suggestive of acute pancreatitis. Findings on magnetic resonance imaging (MRI) were suggestive of acute edematous pancreatitis. Patient was started on parenteral antibiotics, intravenous fluids and analgesics. Her symptoms improved. Figure 1. Acute edematous pancreas (arrow). On day 4 of admission, the patient went into spontaneous labor, progressed well and delivered a male child. Apgar scores were 3/10, 6/10 and 7/10 at 1, 2 and 10 minutes respectively. Post delivery as the baby was unable to maintain saturation, heart disease was suspected and a neonatal 2D echo was done. Baby succumbed at 18 hours of life; post mortem revealed congenital heart disease. The patient was kept nil per oral and started on parenteral antibiotics, hydration and analgesics. Oral feeds were started after surgery opinion. On day 6 postpartum, patient developed abdominal distension, she was kept nil by mouth, transferred to surgical ward for further management. X ray chest was done suggestive of abdominal distension and bilateral pleural effusion. Conservative management was continued. 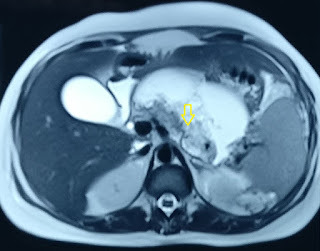 MRI abdomen was done which revealed acute necrotizing pancreatitis with splenic vein thrombosis. Figure 2. Necrotizing pancreatitis (arrows). Repeat amylase levels were 334.6 units/ liter. Low molecular weight heparin, antibiotics and total parenteral nutrition were started. She developed pancreatic pseudocyst for which CT scan guided drainage was done. Patient stabilized after that, she was continued on conservative management. After two weeks, her condition deteriorated. Repeat CT scan was done which showed enlargement of the pseudocyst with necrotizing pancreatitis. She was taken for necrosectomy of pancreas, however, surgery was abandoned due to excessive blood loss. Blood was transfused; she was transferred to ICU, managed on antibiotics and IV fluids. After 24 hours she expired. In this case, the onset was during pregnancy; this progressed rapidly, worsening her parameters. Even in the postnatal period, her course was stormy and she required rigorous fluid, electrolyte and nutritional management with a guarded outcome, till she finally succumbed. Acute pancreatitis in pregnancy is most often caused by gall stones, alcohol and hypertriglyceridemia. [1,5] During pregnancy, in second and third trimesters, hepatic bile secretion increases, and gall bladder emptying is reduced due to increased progesterone leading to increased formation of gall stones. Alcohol causes bile duct acinar damage, which contributes to formation of gall stones.Other causes of pancreatitis are hyperparathyroidism, connective tissue disorders, infections, trauma. Pancreatitis usually presents with multiple episodes of vomiting, abdominal pain, and nausea as seen in our patients. With these symptoms in first trimester, hyperemesis gravidarum is the most common differential diagnosis. Pain of ectopic pregnancy can mimic acute pancreatitis  Raised serum amylase and lipase levels are diagnostic; however the degree of enzyme elevation may not correlate with disease severity. Leucocytosis, hypocalcemia, elevated serum bilirubin and transaminase levels may be seen. Pregnancy itself is a known cause of hypertriglyceridemia but if triglycerides are more than 1000 mg%, the prognosis is worse. Ultrasound is done as it is safe in pregnancy. MRI is preferred over ERCP as the latter in an invasive procedure, unless surgical intervention is also required. Other modalities used are endoscopic ultrasound, magnetic resonance pancreatography (MRCP). Complications are systemic inflammatory response syndrome, acute respiratory distress syndrome, peritonitis and pancreatic necrosis. Mothers have higher chances of preterm delivery, fetal loss, but majority do not develop complications. Significant improvement is seen in treatment of pancreatitis and detection of complications due to better imaging techniques, better supportive measures and overall improvement in maternal and perinatal care. Treatment of pancreatitis depends upon the severity of the disease, duration of gestation, cause of pancreatitis and could either be conservative or surgical. Conservative management includes bowel rest, analgesics, antibiotics and parenteral nutrition. Surgical treatment is considered when there is pancreatic enlargement and necrosis and gastrointestinal perforation. Our patients were treated conservatively following which one improved, was discharged and subsequently had no intrapartum and postpartum complications. The second case saw a worsening course in the postnatal period, requiring intense management and prolonged recovery curve. Timing of termination of pregnancy has been debated. There are studies that recommend termination of pregnancy and even cesarean section as the preferred method of pregnancy termination. Early diagnosis and multidisciplinary management are crucial in improving fetomaternal outcome in pancreatitis complicating pregnancy. Pitchumoni CS, Yegneswaran B. Acute Pancreatitis in Pregnancy. World J Gastroenterol. 2009; 15(45): 5641-5646. Igbinosa O, Poddar S, Pitchumoni CS. Pregnancy associated pancreatitis revisited. Clin Res Hepatol Gastroenterol. 2013; 37(2):177-81. Wang GJ, Gao CF, Wei D, Wang C, Ding SQ. Acute pancreatitis :Etiology and common pathogenesis. World J Gastroenterol 2009;15(12):1427-30. Sun Y, Fan C, Wang S. Clinical analysis of 16 patients with acute pancreatitis in the third trimester of pregnancy. International Journal of Clinical and Experimental Pathology. 2013; 6(8): 1696-1701. Ducarme G, Maine F, Chatel P, Luton D, Hammel P. Acute pancreatitis during pregnancy: a review. J Perinatol. 2014; 34(2): 87-94. Vonlaufen A, Wilson JS, Apte MV. Molecular mechanism of pancreatitis: current opinion. J Gastroenterol Hepatol. 2008; 23(9): 1339-1348. Mitura K, Romanczuk M. Ruptured ectopic pregnancy mimicking acute pancreatitis. Ginekol Pol. 2009; 80(5): 383-385. Masselli G, Brunelli R, Casciani E, Polettini E, Bertini L, Laghi F, et al. Acute abdominal and pelvic pain in pregnancy: MR imaging as a valuable adjunct to ultrasound? Abdom Imaging. 2011; 36(5): 596-603. Working group IAP/ APA Acute Pancreatitis Guidelines. IAP/ APA evidenced based guidelines for the management of acute pancreatitis. Pancreatology. 2013; 13(4 Suppl 2): e1- 15. Yokoe M, Taskada T, Mayumi T, Yoshida M, Isaji S, Wada K, et al. Japanese Guidelines for the management of acute pancreatitis: Japanese guidelines 2015. J Hepatobiliary Pancreat Sci. 2015; 22(6): 405-32.